A great shower is the sum of many parts working together. From mixing the water to delivering it to the shower head, investing in quality components will transform your morning shower into an enjoyable and exhilarating experience. First you will need a shower faucet (mixer valve) to mix the hot and cold water. Mixer valves are available with or without a thermostat and can be either concealed (built into the wall) or exposed. Most head showers are used in combination with a concealed mixer. The water pipe containing the mixed water is concealed in the wall behind the tiling until it reaches the showerhead. Hand showers can be used with either concealed or exposed mixers. You will require a shower hose and a riser bar or shower holder to attach the shower to the wall. A riser bar is the preferred choice if the hand shower is your only shower as it lets you adjust the height of the showerhead. Choose a handshower that offers a choice of different spray patterns. This allows each user to personalise their experience. Riser bars are ideal for multi-generation households as the height of the shower can be altered to suit both children and adults. Concealed mixers or thermostats give you the freedom to locate the shower controls wherever you choose. If you are planning a large walk-in shower then locate the controls close to the entrance, so that you can turn the shower on without getting hit by an initial rush of cold water. The controls should be easy and intuitive to use. Look out for levers and handles which move smoothly with little effort. When it comes to shower systems and shower faucets no one does it better the Grohe. They are the king of the shower system and Rain Shower head. The Faucet Expert recommends Grohe Shower Faucets and shower systems. Grohe Faucets is also a leader in stylish kitchen and bath faucets. Both the size and shape of your kitchen will help you to determine the best way to utilise the space. The principal activity zones: the sink, the cooker or hob and a preparation/serving area, should be laid out in a triangle and contained within an area that is uninterrupted by through traffic. This is often referred to as the work triangle and is the most efficient way to plan a kitchen, as it cuts down on time spent walking between these areas. It may be that you will need to re-locate some of the service points – e.g. water, electricity and waste pipes – within the space to create the best layout. Ideally there should be an area of work surface, either side of the sink and hob. Freestanding range-style cookers give a semi-professional look. If you prefer built-in appliances, then consider locating a single or double oven in a tall unit as they are more convenient to use at this height. Remember that front-loading appliances, such as ovens and dishwashers, will require extra space in front of them for comfortable access. Locate this dishwasher adjacent to the sink, so that you can easily pre-rise dishes before loading the dishwasher. Consider the amount of storage space you will need for food, pans, tableware and small appliances. Locate wide pan drawers between the sink and the hob and allow adequate surface space for the kettle, toaster and other frequently used extras. Wall units often make a small kitchen appear smaller, so consider glass-fronted doors for a lighter feel, or combine them with open shelving. Tall pull-out larders are now popular and allow easy access to all their contents. Mid-height and full-height units can be used to house a built-in appliance as well as provide extra storage space. For great kitchen faucets that will set the style for you kitchen and home, we recommend Grohe Kitchen Faucets. For maximum flexibility, choose a shower that offers a choice of spray patterns. Today’s hand showers are sophisticated pieces of engineering. They offer a selection of sensations, enabling each user to select their preferred pattern to suit their mood or the time of day. Rain showerheads feature a generous number of shower nozzles creating a wide and delicate pattern to soothe the skin. Enriched with air bubbles, Champagne patterns are soft and luxurious – ideal for a relaxing shower. 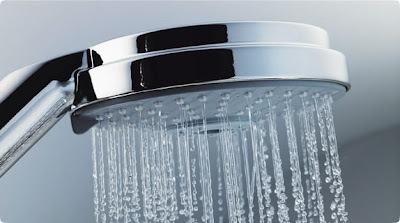 A Pure pattern is simply a wide stream of water delivered from the centre of the showerhead. By reducing the number of nozzles used, the pressure of the water is increased. An intense spray for targeting areas. The therapeutic of this pulsating pattern will relax and soothe the body and mind. This all-encompassing spray is a great all-rounder and the perfect way to freshen up. When it comes to showers there is no one better in the business then Grohe. The Rainshower® was made popular and trademarked by Grohe. We believe that Grohe shower faucets are the superior of the industry. 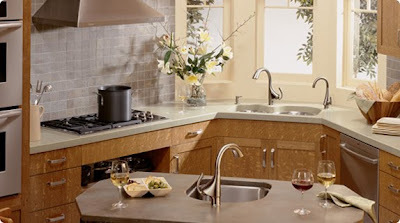 A GROHE classic that has evolved with the times, the Grohe Ladylux (the original kitchen pull-out faucet) is the centerpiece of some of America's finest kitchens. GROHE's best-selling pull-out faucet has been given a new, updated look that combines the innovative design of today's modern kitchens with the functionality and durability of a professional tool. The new Ladylux3 features a dynamic and flowing silhouette with a more streamlined body than its predecessors. The flower-like body rises organically from the counter and merges with an elegantly arched spout and distinctive lever. Available in pull-out and pull-down versions, all feature dual-spray functionality and forward rotation lever handle to eliminate backsplash installation limits. 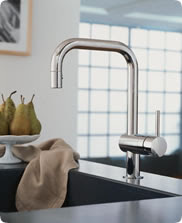 The Ladylux³ suite from Grohe Faucets includes two cold water pot fillers: a deck mount and a wall mount. Both Ladylux³ pot fillers are produced from GROHE StarLight® our unique deep chrome finish and GROHE RealSteel® - solid, Grade 304 stainless steel and include the smooth, precise action of GROHE SilkMove® ceramic cartridge technology. Click here to see the entire Grohe Ladylux collection with all suites and versions new and old. 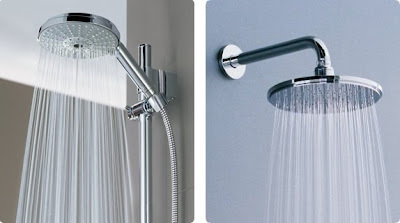 Hansgrohe vs. Grohe which is better? Many consumers get these 2 brands confused as the same. 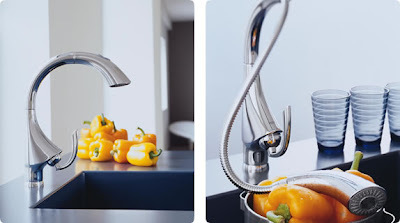 Left image: Grohe K4 single-lever faucet in chrome with pull-out rinsing spray. Right image: The rinsing spray retracts into the spout and offers a choice of two patterns. The Kitchen Faucet is now a sophisticated piece of engineering. To meet the demands of keen cooks, high wide-angle swivel spouts with large extension and extractable rinsing sprays are fast becoming a pre-requisite and higher spouts the norm. Extra-large pots are now commonplace in the kitchen, so make sure you select a faucet with a spout that is high enough to accommodate your largest pan. If you have a double sink ensure that you choose a faucet with a wide swivel action to allow you to switch easily between the bowls – some models now feature a 360 degrees swivel spout. Pull-out mousseurs and ergonomically-designed hand sprays bring extra functionality to the workspace. Both are attached to a retractable hose that sits within the spout. Many handsprays feature a trigger action button, which activates a wide spray pattern – perfect for rinsing delicate salad leaves. Look out for silicone nozzles as these repel limescale and are easy to clean. Hip! Hot! Clean lines, smooth surfaces, modern metals, maximum minimalism! Graff, always at the pinnacle of kitchen and bath style, is flirting with the future of design with the Structure lavatory faucet. The cutting-edge style and shape are distinctly recognized as geometric - but the “Structure” is all new. A fine, luxurious, multifaceted faucet, Structure is crafted with an industrial look - angles merging into angles. Gleaming metal, so magnificently configured, commands the notice that positions this simple, yet dramatic, faucet as the focal point of any contemporary bath. The beautifully engineered Graff Structure (Model G-3100-C12-PC) is shown as a lavatory faucet in polished chrome. It is also available in brushed nickel or Steelnox™ satin nickel. Coordinating roman tub set, deck-mounted handshower and diverter set, and thermostatic shower systems are also offered. American ingenuity and European craftsmanship are the cornerstones of Graff’s design commitment to create innovative, cutting-edge faucets and accessories. With over 80 years of plumbing and hardware manufacturing experience, Graff uses solid brass and German ceramic valves for faucets that perform as exceptionally as they look. Graff Faucets stands behind its work with confidence to offer a full lifetime warranty on all mechanical aspects of its entire product line. Hansgrohe vs Grohe Which is Better? We get many consumers who ask us if Hansgrohe and Grohe are the same company since Grohe is in both names. The answer is No. They are similar with a common heritage, but 2 very separate and competing companies. We will give you a brief summary and outline what we think separates the two apart. Hansgrohe was the original company founded in Germany by Hans Grohe in 1901. It is now majority owned by the MASCO Group which owns other brands such as Delta Faucet and Brizo Faucets. I guess this German manufacturer can now be called American Owned. Its US headquarters is located in Atlanta, Georgia. Grohe was founded in 1911 as Berkenhoff & Paschedag in Hemer Germany. It was taken over in 1936 by Frederich Grohe, son of Hans Grohe. Grohe has been sold a few times since and now directly competes against Hansgrohe. Grohe is no longer owned by a Grohe family member, was sold a few times and now is privately owned. The Grohe America headquarters is located in Bloomingdale, IL. The current Hansgrohe slogan is "Das Orginal" which signifies to everyone that they are the original Grohe. Both are awesome German or European faucets. Very modern and top of the class in terms of Shower Faucets, Rain shower heads and contemporary Faucets. In February of 2010 we learned that Hansgrohe implemented an Internet Minimum Asking Price which increases the perceived value of the Hansgrohe brand. Retailers are informed that they can't sell the product to a consumer for less then 30% off the MSRP. We were previously seeing sales of Hansgrohe at 40% off list price or MSRP. 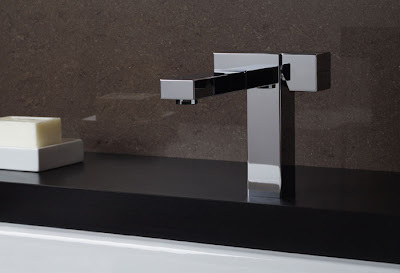 Not only did the wholesale cost go up in February from Hansgrohe to the wholesaler/retailer but then the required selling price to the consumer has increased to a fixed minimum price. This is never a good approach to the American Consumer. Basically the consumer has to pay more money for the product. We believe that this only fixes the profit to the retailer but we retailers aren't concerned about fixed pricing. This means you the consumer get no discounts on the brand and then there is no competition in the retail market for you to shop around for a better price. The IMAP price is at 30% off the MSRP. Considering Hansgrohe Faucets and Grohe Faucets are of the same quality and design, Grohe currently sells at about 60% of the MSRP price. Based on that you get the impression that Grohe is now the better value. The AXOR line by Hansgrohe has now been banned from Internet Sales all together. Thats right!! Banned from the fast growing Home Improvement channel where consumers "Want" to shop and are flocking. This is also done to make it very difficult to find via limited distribution and therefore the customer will be forced to pay full MSRP on the products. We believe this messes with the free market and making it more difficult for consumers to find the product is the wrong approach for a manufacturer these days. High income households consumers with limited time dont want to drive 50 miles to find the product at full price. They want their life made easier with the internet and the ability to shop online for the best deal on their time and location. Other great comparable brands such a Graff Faucets, Riobel and Fluid Faucets, Kraus, Aquabrass are actually going the other route and making their high end brands more accessible to the consumer. This helpful video will walk you through the basics of installing a Kohler Toilet. Follow the instructions and it will be quite easy. The product used in this installation is a Kohler Cimarron Toilet. Be sure to follow the safety instructions included with the product and to observe and follow all local plumbing and building codes. Step 1: A Few Tips Before You Begin InstallationFor this installation you will need the following tools: A putty knife, Adjustable Wrench, Hacksaw, Level, Tape Measure, Sponge and Replacement Wax Seal. Step 2: Removing the old toilet:Before you begin, turn off and disconnect the water supply. Flush the old toilet. Remove any remaining water in the old tank and bowl with a sponge. Loosen the T-bolts that secure the bowl to the floor. Rock the bowl from side to side to loosen the wax seal underneath the toilet. Remove the bowl and use a putty knife to remove the old wax seal. Wipe away any remaining wax with a rag or damp sponge. Step 3: Placing the Wax Seal and Installing the bowl.With the new toilet bowl resting on a padded surface, attach the new wax seal to the bottom of the bowl. Align the toilet bowl outlet with the flange. Apply weight and press down on the bowl to set the wax seal. Do not move the toilet bowl once wax seal has touched the flange. This may break the seal resulting in leakage. If the wax seal is broken you will need to replace the wax seal. Place the plastic cap bases over the T-bolts in the up position as marked. Slide a washer and nut onto each T-bolt. Evenly tighten the nut onto the T-bolts until the nuts are secure. Careful not to over tighten as this may damage the product. If necessary, shorten the bolt by cutting it with the hack safe. By very careful not to touch the bowl with the hacksaw. The hacksaw can chip or break the toilet. Mount the plastic caps onto the cap bases. Slide the retaining bolts into the brackets on the bottom of the tank. Press the gasket onto the tank outlet. Position the tank on the bowl by centering the gasket on the bowl inlet. Assemble the washers and nuts to the tank retaining bolts. Ultimately tighten the nuts so the tank is level and the mounting brack tabs make contact with the bowl. Connect the water supply to the tank. Open the water supply valve and check for leaks. Make any adjustments as needed. install the toilet seat according to the seat manufacturer's instructions. Place the tank cover on the tank. Congratulations, the installation is complete. Step 6: Adjusting the Tank Water LevelYour toilet is designed to use either 1.6 gallons or 1.4 gallons per flush. Adjust the flush volume by adjusting the water level in the tank to the appropriate water line. The water lines are marked on the flush valve. To raise the water level, pinch C-clip and slide it up the float rod. After watching the video I am sure you feel that as a Do-It-Yourselfer (DYI) you now confidently feel you can install a toilet pretty easily. By ordering the product online, from the online faucet and toilet leader eFaucets.com, and then installing it yourself, you will save hundreds of dollars. We sell all Kohler Toilets and Kohler Faucets in all options and colors. Installing Kohler Kitchen Faucets. The installation above is for a Kohler single handle kitchen faucet with a side spray. Its easy as 1-2-3 and you can do it quickly and easily while saving yourself $100's of dollars. Buy it online and install it yourself in minutes. After removing the old faucet, slide the undercover over the faucet supply hoses and the hose outlet. Feed the faucet supply hoses and outlet through the sink hole and position the faucet. Slide the bracket and washer over the stud and thread on the nut and tighten securely. From under the sink, securely hand tighten the nut onto the water supply shut off valve. Insert the spray holder through the sink hole. Insert the hand spray hose through the spray holder and attach the hose to the hose outlet. 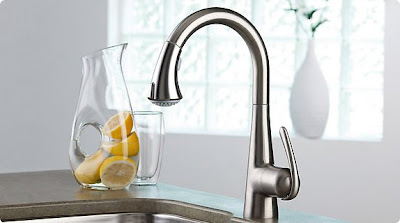 Kohler Faucets are some of the best and most durable faucets sold. Save money by buying them online from the online faucet leader eFaucets.com. They ship out the same day as ordered and quick ship right to your door step. Just in time to install on the weekend. Local stores may carry a few products but all the KOHLER products are available online so you have all the options that match your desire.